ManpowerGroup's free webinar series is a convenient, cost effective way to give your company - and your career - an advantage. Our webinars connect you to leading workforce, safety, technical and management experts who deliver the latest insights on topics such as HR industry trends, employment law, training and retention and much more. Join more than 35,000 other professionals who take advantage of this learning opportunity. Mark Toth, Chief Legal Officer of ManpowerGroup™ North America, and Neil Alexander, of Littler Mendelson. Join ManpowerGroup for a complimentary webinar designed to reduce your employment law nightmares. 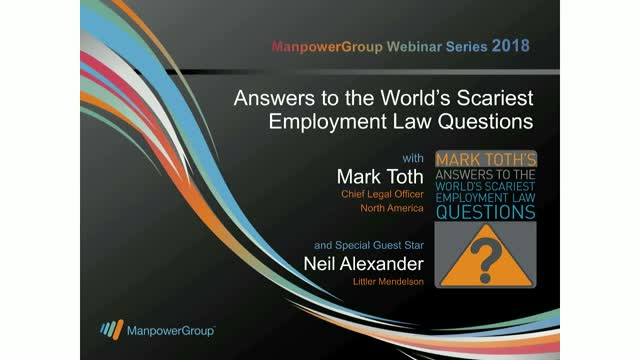 In this engaging and interactive webinar, Mark Toth of ManpowerGroup and guest Neil Alexander of Littler Mendelson will answer the world’s most terrifying employment law questions. Mark and Neil will not only address the questions that keep you awake at night but also ensure that you get all the latest employment law news on everything from hiring to firing and beyond. Your host is Mark Toth, Chief Legal Officer of ManpowerGroup™ North America, a former partner in a major employment law firm, and widely known for his ability to present legal and HR issues in a uniquely entertaining style. Special guest Neil Alexander, of Littler Mendelson, has represented companies in employment disputes all across the U.S. for the last 25 years. Neil’s practice focus includes unfair competition disputes, whistle blower and retaliation claims, ADA and FMLA disputes, wrongful termination claims and allegations of harassment or discrimination. This webinar is approved for 1 HRCI credit. The use of the HRCI seal confirms that this activity has met HR Certification Institute’s® (HRCI®) criteria for recertification credit pre-approval. In this engaging and interactive webinar, Mark Toth of ManpowerGroup and guest Tobias E. Schlueter of Ogletree Deakins will answer the world’s most terrifying employment law questions. Mark and Tobias will not only address the questions that keep you awake at night but also ensure that you get all the latest employment law news on everything from hiring to firing and beyond. Special guest Tobias E. Schlueter, of Ogletree Deakins in Chicago, is a strategic advocate and litigator for businesses in employment and unfair competition matters. Mr. Schlueter was selected as a Best Lawyer in America in 2017 in Employment Law – Management. This program has been approved for 1 recertification credit hour toward PHR, SPHR and GPHR recertification through the Human Resource Certification Institute (HRCI). The use of this seal is not an endorsement of the HR Certification Institute of the quality of the program. It means that this program has met the HR Certification Institute’s criteria to be pre-approved for recertification credit. DISCLAIMER: This presentation and the materials are provided for informational purposes only and should not be considered legal or HR advice. Please consult your HR or Legal representative before using or implementing any of the processes or information contained herein. Join ManpowerGroup for a complimentary webinar designed to provide insight into what’s new and what’s next in employment law. It’s a new year and there’s no shortage of interesting things happening in the world of employment law. In this engaging and interactive webinar, host Mark Toth of ManpowerGroup and special guest Thomas E. Deer, attorney with Ogletree Deakins, will provide updates on all the latest developments as well as their perspectives on what may be coming next. Along the way, they will share plenty of tips and tools to help you stay out of legal hot water. Special guest Thomas E. Deer, an attorney with Ogletree Deakins in Chicago, represents management in a variety of employment-related matters and has been named to every edition of Best Lawyers since 2009. For a sneak preview, check out Mark’s popular employment law blog, or "blawg" at manpowergroupblogs.us/employment_blawg/. In this engaging and interactive webinar, Mark will answer the world’s most terrifying employment law questions. He’ll not only address the questions that keep you awake at night but also ensure that you get all the latest employment law news on everything from hiring to firing and beyond. Your host is Mark Toth, chief legal officer of ManpowerGroup™ North America. Does your organization struggle to find the right talent? You’re not alone. Many organizations face ongoing challenges finding the right candidates with the right skills – the people who can improve performance, strengthen competitive advantage and drive sustainable growth. In fact, while surveying over 5,000 hiring managers, ManpowerGroup's 10th annual Talent Shortage Survey revealed that 1 in 3 U.S. employers continue to struggle filling mission-critical positions. Join ManpowerGroup for a complimentary webinar designed to provide insights into the talent shortage and offer strategies to overcome hiring challenges and accelerate business success. •Gain insights into factors behind the talent shortage and how it impacts your organization. •Learn how your hiring challenges compare to those of other employers and understand why competition for in-demand talent today is so intense. •Get insights into the top 10 hardest jobs to fill, how they have changed over the past decade and why employers continue to have difficulty filling these critical roles. •Identify strategies you can pursue to overcome your shortages and win the race for in-demand talent. Your expert for this informative webinar is Christopher Rowland, ManpowerGroup Managing Director. It’s a new year and there’s no shortage of interesting things happening in the world of employment law. In this engaging and interactive webinar, Mark will provide updates on all the latest developments as well as his perspectives on what may be coming next. Along the way, he’ll share plenty of tips and tools to help you stay out of legal hot water. Organizations of all shapes and sizes are constantly challenged to adequately fill and strengthen their leadership pipeline – thus calling into question if they are truly prepared to take on the challenges of today and achieve the strategy charted for the future. Please join us for an exciting and thought provoking webinar featuring Gelair Gilson and Jayson Finnigan from ManpowerGroup as they explore challenges to attracting high performing talent to leadership roles and the keys to identifying and fostering potential in the next generation of leaders. In this engaging and interactive webinar, Mark will answer the world’s most terrifying employment law questions. Mark will address the questions that keep you awake at night and ensure that you get all the latest employment law news on everything from hiring to firing and beyond. Your host is Mark Toth, chief legal officer of ManpowerGroup™ North America, a former partner in a major employment law firm, and widely known for his ability to present legal, HR and business issues in a uniquely entertaining style. Your inbound and outbound call teams directly interact with your customers and impact satisfaction, word of mouth and revenue. Yet attrition in contact center/customer service roles is a chronic problem for many organizations—whether you have dozens of agents or a handful of phone reps.
Are these simply high-turnover roles? We don’t think they have to be. Hear from Manpower’s contact center experts how to better manage attrition and increase your ROI. Plus, they’ll share real examples of how Manpower has moved the needle on retention and satisfaction. This program has been approved for 1 recertification credit hour toward PHR, SPHR and GPHR recertification through the Human Resource Certification Institute (HRCI). Organizations face ongoing challenges finding the right candidates with the right skills – the people who can improve performance, strengthen competitive advantage and drive sustainable growth. In fact, ManpowerGroup's 9th annual Talent Shortage Survey revealed that more than 1 in 3 U.S. employers continue to struggle filling mission-critical positions. • Gain insights into factors behind the talent shortage and how it impacts your organization. • Learn how your hiring results compare to those of other employers. • Benchmark your hiring challenges, and understand your competition for in-demand talent. • Get insights into the top ten hardest jobs to fill. • Identify creative sourcing techniques you can pursue to overcome the talent shortage and win in today’s intense race for skilled talent.